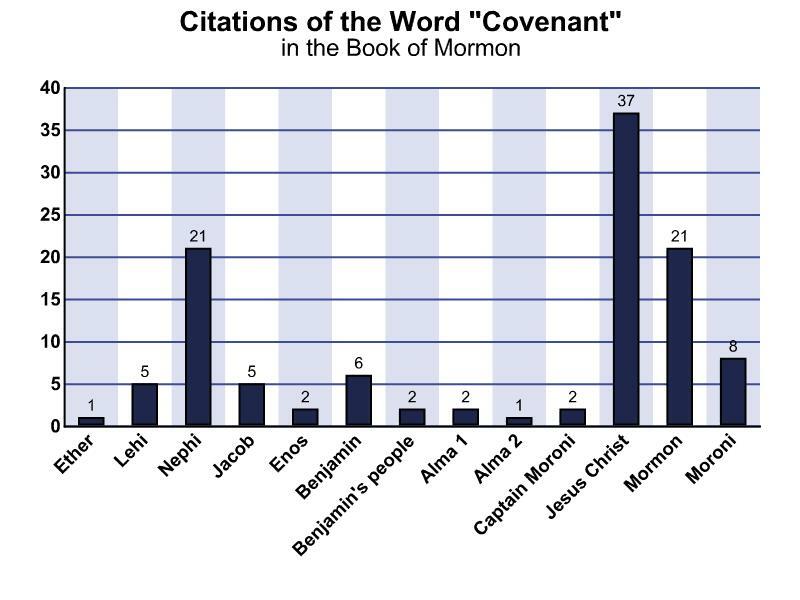 Book of Mormon Central / Archive / Citations of the Word "Covenant"
Citations of the Word "Covenant"
Title Citations of the Word "Covenant"
The term covenant appears more than 150 times in the Book of Mormon. As this chart illustrates, the covenant relationship with God was important to the Nephites, both those living the law of Moses in the promised new land and those living the gospel of Jesus Christ after the old law was fulfilled. This bar graph displays the number of times that ten Nephite authors, along with the Jaredite prophet Ether, King Benjamin's people, and Christ himself, speak of the "covenant." The number of occurrences is relatively high in two eras, when the promise of the new land to Lehi's posterity and the gospel of Christ are first established in the Americas (see, for example, 2 Nephi 1:5; 3 Nephi 20:26). Incidentally, in those eras there is also a positive correlation between frequent covenant citations and high levels of righteousness.